Water in a garden is a very exciting and interesting thing to have in any outdoor space. Water will fit into any scenario – although I would say that as I love to promote the benefits of water in the garden. Water can add a level of tranquility to the garden, giving a stillness and soothing sound, or it can be used more dynamically to add excitement. All of this is dependent upon the design you choose to create the scenario that you want to achieve. Although generally considered to require lots of upkeep, I would suggest that a well-designed pond is actually much easier to maintain, and certainly takes less time to look after than a well-kept lawn, or flower beds of a comparable size. Ponds are thus ideal for our modern busy lifestyles on a number of levels, especially as they give you a tranquil area to escape to at the end of the day with a glass of wine enabling the stresses of the day to ebb away. You can bring an element of the wild into your garden. Say for instance you like to go on walking holidays, elements of this can be brought into the garden using careful design of rocks, plants and water. Perhaps, instead, you prefer the more structurally rigid design of an Italianate garden. Once again with careful design elements of this style can be brought into your garden using a water feature. Smaller spaces lend themselves well to small enclosed water features. You can even have a pondless feature, such as water wall or pebble fountain that brings water movement to the garden with minimal space. The best place to site a pond in the garden is where it faces direct sunlight. Water plants love lots of sun. Six to eight hours of sunlight per day is ideal for water plants. In more shaded spots perhaps look towards ferns and hostas around the pond instead of water plants. if you are looking for an irregular shaped water feature then planting is essential. The stone edges of the pond are going to give it a hard shape, which the plants will break up and soften. Think of the hard landscaping as pencil lines, whilst the plants are more like a water colour painting that give a more natural feel. You can think about other hard structures. For example, bridges are often included to give added interest to larger pools. You can have a flat pond design that simply links the two sides of the pool, or give the pool a more traditional feel with an arched bridge. 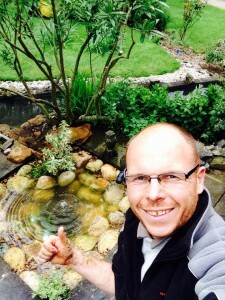 You may already have a strong idea of the style of pond design that you want to have built in your garden, but I would always advise having a pond design consultation before you go to far, and certainly before you start digging or buying equipment. Try to get together a folder of images, drawings, and ideas of the type of water feature that you want to create. From this we can suggest how best to create the look you prefer within your garden. There are loads of places to find inspiration for your water feature. The internet has revolutionised the spread of information and a quick search will pull together literally hundreds of images. 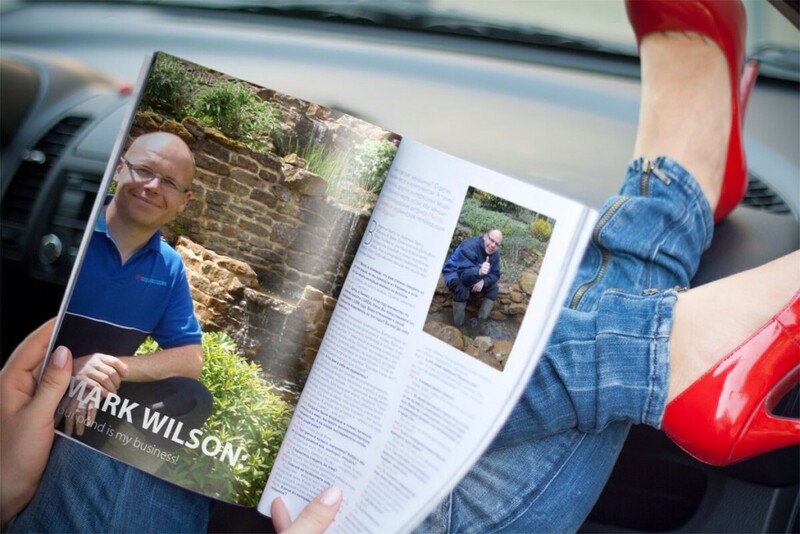 Magazines are another great way of finding information, as are TV shows, either the more general gardening programs or specialist pond programs such as ‘Pond Stars’. I know these reality TV style programs aren’t to everyone’s taste, but they do give a good idea of some of the things that are possible. Gardening shows are another great way to gather ideas as you can actual see how the design will look in-situ. Remember, what might look good on the page or screen might not work so well in practice. Water gardening was featured at Chelsea last year and that definitely created a great deal of interest in this form of garden design. Remember though, there is always a great deal of thinking and planning to undertake before you get started. Build it once and build it right is my motto! Water garden design is very distinct from both gardening and construction. 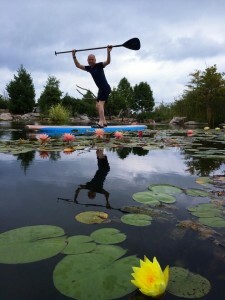 Bringing together elements from both, plus water, creates its own unique set of problems that the skilled pond designer will be able to overcome. Over the years we have been called in to repair a huge number of water features that have been built incorrectly in the first place and which, over time, have begun to fail. In most cases proper design and construction would have prevented this from happening. When working on a pond design, the worst enemy of the water gardener is haste. Rushing in with a spade and digging a hole is what we all want to do, but believe me it is very easy to come unstuck if the fundamental design is not carried out correctly. Water is both heavy and unforgiving. If your levels are out, you pond not constructed correctly so that it has a firm base, or built using the wrong components and sooner or later it will spell trouble. The hardest part is not digging the hole, it is thinking about the hole you are going to dig. Will you need mechanical diggers or will hand tools be enough? Remember also that the loosened spoil that you remove from the hole will increase in volume by about a third. How are you going to distribute or dispose of that amount of soil? Has the ground around the pond settled properly? Especially on new build properties the soil may take a year or more to compact and settle. We would always advise leaving at least 12 months before building a pond on ground that has recently been disturbed. Many people think they can cut corners on the liner they use on their pool, thinking that in the short term it will be fine. We always use a 1mm EPDM rubber liner, which has a much longer life and is more robust, if a little more expensive. Using EPDM also keeps cost down, gives you much more flexibility in shape and is quicker to install. As long as the base is built correctly then rocks and pebbles actually increase the longevity of the liner by protecting it from UV light. You do need to think about the construction technique when installing big rocks or when there is a danger with tree roots, but incorporating an underlay, either above or below the liner, can solve these problems. Most of the time when we are called out to mend a leaking pool it is because the underlying substrate has not been considered when installing the liner. Normally this can be in the form of stones, shifting soil caused by water ingress under the liner, or tree roots. The next most common form of liner punctures comes about from owners, either using rakes and other sharp objects to clean the pond, or animals and children puncturing the liner. Concrete can be used to construct ponds, but really lends itself back to the more formal shaped designs. For most applications water gardeners are switching away from concrete because of the cost and complexity of installation, even though when constructed correctly it does give a long life span. However, when it comes to pond design, there are few worse jobs than trying to remove a badly constructed reinforced concrete pool. Pre-formed fibreglass is another option that some people prefer. Remember though that you are likely to have a limited choice of shapes and sizes and this can be a relatively expensive way to create even quite a small water feature.